Consistently described as emotional, beautiful, passionate and idiomatic, the playing of Sebastian See-Schierenberg has moved and touched audiences around the world. Recent performances have included recitals at the Palais des Beaux-Arts Brussels, the Konzerthaus Berlin, and the Luxembourg Philharmonie, a series of concerts with eminent pianist JulianJacobson, and recitals with Debussy specialist Noriko Ogawa. Sebastian heads a delivery team that organises and promotes numerous and diverse international projects. In 2014 Sebastian was active in Myanmar (Burma) on behalf of his charity Live4Music and delivered a series of televised concerts in collaboration with the Ministry of Culture and the British Council there. He also started a violin programme for blind children from the deprived townships of Rangoon and was invited to lead them in a televised concert at the National Theatre of Rangoon. Sebastian is currently organising a project that will see the first young people’s orchestra of Burma being formed. The orchestra will be taken on a country wide tour by him, a project that will be documented and broadcast to over 3 million people in Burma by BBC Media Action. Other recent international projects have included recital tours of Taiwan, Singapore, Brunei and Malaysia where he performed in such prestigious venues as the Singapore Esplanade and the Philharmonic Hall and Performing Arts Centre in Kuala Lumpur, a collaboration with the University of the Illes Balears in Spain which delivered an international live-streaming project which resulted in his recitals being broadcast live to thousands of students in universities and schools all over the world, and a live performance of a score which he co-wrote for a production of Shakespeare’s Midsummer Night’s Dream at the historic Strand Hotel in Myanmar. Throughout his performing career, Sebastian has always been committed to music education and has held teaching posts at the Trinity College of Music, London, Bowdoin Festival USA, Lisbon Orchestral Academy and the Malaysian Philharmonic Music Chambers. He is regularly invited by the leading Universities and Schools throughout Asia to give masterclasses and recitals. 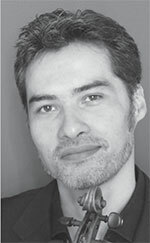 Sebastian gratefully acknowledges the generous support and sponsorship he has received, particularly from the British Council, HSBC, BP, INTI (Laureate International Group), USM, CESAG University Spain, the British High Commissions in Myanmar, Malaysia and Brunei, and the Sir Vernon Ellis Foundation.